For more information, please visit each individual event page. Per ulteriori informazioni, si prega di visitare la pagina di ogni evento. Trinacria Theatre Company presents its inaugural theatrical production, La Storia di Colapesce. The production is an original piece created and devised by the company during a 4-week residency in Sicily, at San Placido Calonerò in the Messina region of Sicily. The cast of La Storia di Colapesce is comprised of an ensemble of eight American theatre artists. 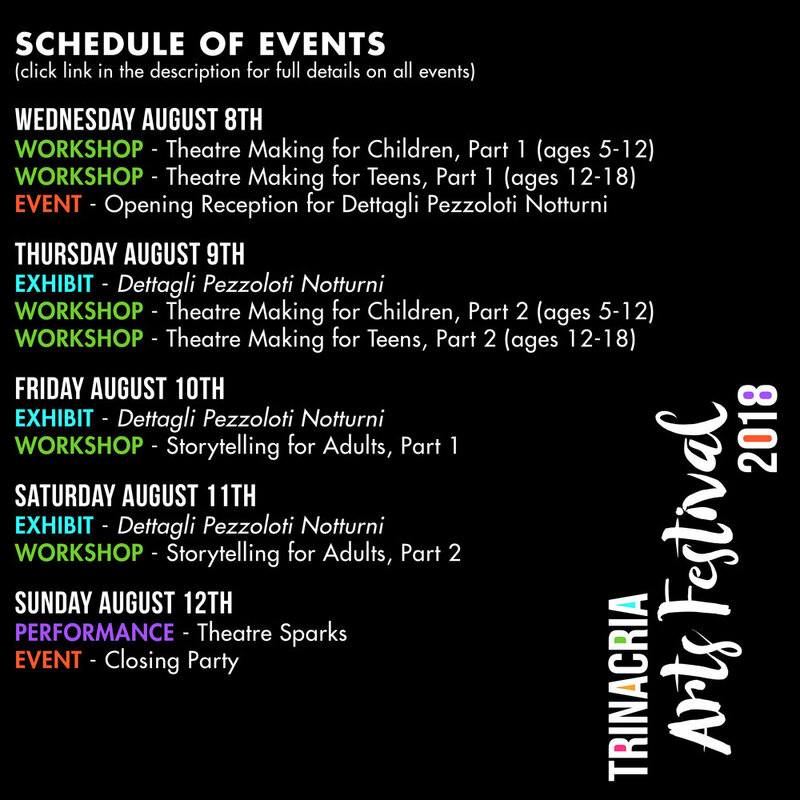 The Trinacria Theatre Company’s mission is to use theatre as a tool to promote Sicilian history, heritage, and culture at home and abroad. The story centers around the Messinese folk legend of Colapesce, which tells the story of a fisherman’s son named Nicola who spends so much of his time diving beneath the waves that he is said to be half-man, half-fish. A wide variety of tales are told of Colapesce’s incredible ability, and the news eventually reaches King Frederick the II of Sicily, who tests Colapesce’s powers of diving. The King repeatedly sends Cola to the ocean’s bottom, where he finds something terrible lurking in the deep, threatening to destroy the city of Messina. Trinacria Theatre Company reinvents this classic fable using a wide variety of theatrical story-telling techniques. The bilingual performance was developed during a four-week residency in Sicily, during which time company members lived, worked, studied, and rehearsed at the Istituto San Placido Calonerò, in partnership with the Enoteca Provinciale Messina, two organizations dedicated to the promotion and preservation of local Sicilian heritage. Gloucester has long been recognized as a beautiful and quaint fisherman's community, but it also boasts a rich history of Italian and Sicilian immigration. What better neighborhood to stage our story of a Sicilian fisherman's son? We are pleased to be performing at the fisherman's church of St. John, and a portion of the proceeds from this performance will go to benefit St. John's Youth Ministry. *All ticket prices are suggested, and admission is permitted on a pay-what-you-can basis. We thank you for your generosity! In keeping with our Sicilian tradition of outdoors performance and our Italian roots, we are thrilled to bring our performance to Boston's most historic residential community and Italian neighborhood: the North End. This is the only outdoors performance in the US, so don't miss this opportunity to experience our performance as it was intended to be seen - with a backdrop of sea and sky! The Watertown Order of the Sons of Italy has been Trinacria's partner in preserving and promoting Italian and Sicilian arts and culture in the US. In order to reach the widest possible audience of Italian Americans and Italian cultural enthusiasts living in the US, Trinacria Theatre Company is offering discounted ticket prices for all Sons of Italy members. Il Teatro della Trinacria presenta la sua inaugurale produzione teatrale, La Storia di Colapesce. Questo spettacolo è un evento internazionale completamente originale, creato e sviluppato durante un soggiorno di 4 settimane nella Provincia Regionale di Messina, Sicilia. La missione del Teatro della Trinacria è di utilizzare il teatro come strumento per promuovere la storia, il patrimonio e la cultura siciliana in patria e all'estero. La storia è la leggenda di Colapesce o Nicola, il figlio di un pescatore di Punto Faro, che trascorre così tanto del suo tempo in acqua al punto di diventare come un pesce. Colapesce sviluppa poteri di immersioni straordinari, in grado di rimanere sott'acqua per lunghezze incredibili di tempo – fino a quando il re Federico II di Sicilia chiama Colapesce, avendo appreso delle sue incredibili capacità. Il re vuole testare Colapesce gettando i suoi beni preziosi in acqua e volendo che il ragazzo li recuperasse, ma in fondo del mare, sotto Messina, Colapesce trova qualcosa terribile che può rovinare tutta l’isola di Sicilia. Il Teatro della Trinacria reinventa la classica storia con nuove interpretazioni teatrali. Questo spettacolo sarà portato in giro in Sicilia dal 16 – 21 agosto, dopo di cui sarà inscenato negli Stati Uniti a New York e a Boston. Gli attori vengono da New York e Boston, e includono Josephine Cooper, Sean Devare, Quinton Kappel, Elena Kritter, Mariagrazia LaFauci, Kathleen Lewis, Dario Sanchez, and Max Sklar.